As Puerto Rico and its people continue to reel from the devastating effects of Hurricane Maria, two of the world's biggest tech companies have outlined plans for bringing power back to the Caribbean island and US territory. 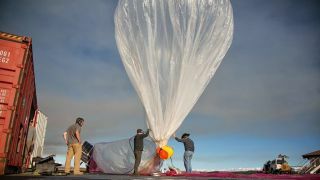 First up Google has just nabbed a temporary license for it to provide an emergency cell network across Puerto Rico using its Project Loon technology - that's where giant, floating balloons are used to get connectivity out to remote areas that lack the usual internet and cell tower infrastructure. As Puerto Ricans try and rebuild their lives, that sort of data service could be vital - According to the latest figures, 83 percent of cell sites are still out of action on the island. The X innovations team that runs Project Loon, which was spun out of Google, now needs to finalize a telecomms firm to partner with. Puerto Rico governor Ricardo Rossello seems open to the idea but there will be a few regulatory and political hurdles to overcome first before Tesla's SolarCity firm can get to work. Currently around 10 percent of residents on the island have power. Musk has previously promised to send some of Tesla's SolarCity batteries over to Puerto Rico, and has in fact now pushed back the unveiling date for the forthcoming Tesla Semi electric truck so that more resources can be diverted to the stricken island.